انصاری, مسعود, اوحدی, امین, رضوانی, محمدعلی. (1386). مانیتورینگ سایش چرخهای قطار به منظور کنترل و برنامه ریزی عملیات نگهداری و تعمیرات. پژوهشنامه حمل و نقل, 4(3), -. مسعود انصاری; امین اوحدی; محمدعلی رضوانی. "مانیتورینگ سایش چرخهای قطار به منظور کنترل و برنامه ریزی عملیات نگهداری و تعمیرات". پژوهشنامه حمل و نقل, 4, 3, 1386, -. انصاری, مسعود, اوحدی, امین, رضوانی, محمدعلی. (1386). 'مانیتورینگ سایش چرخهای قطار به منظور کنترل و برنامه ریزی عملیات نگهداری و تعمیرات', پژوهشنامه حمل و نقل, 4(3), pp. -. انصاری, مسعود, اوحدی, امین, رضوانی, محمدعلی. مانیتورینگ سایش چرخهای قطار به منظور کنترل و برنامه ریزی عملیات نگهداری و تعمیرات. 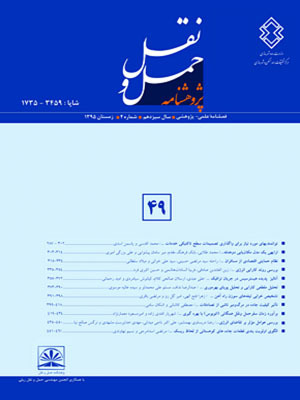 پژوهشنامه حمل و نقل, 1386; 4(3): -. سایش چرخ همواره یکی از مشکلات گریز ناپذیر صنعت ریلی بوده است. جدا از روشهایی که باید برای کاهش سایش اعمال شوند، برنامه ریزی برای تراش، تعویض و خرید بموقع چرخها از اهمیت خاصی بر خوردار است. در این مقاله روشی برای تعیین پیش بینی رفتار سایشی چرخ ارایه می شود که از طریق آن می توان مدیریتی بهینه بر سیستم تعمیراتی چرخ حاکم کرد و زمان رسیدن چرخ به حد تراش از قبل پیش بینی شده و نسبت به انجام عملیاتی مانند پروفیل تراشی و یا تعویض چرخ از قبل آمادگی داشت. به علاوه مقطع زمانی یی که وسیله نقلیه ریلی یاد شده در حالتی که بوژی یدکی در اختیار نیست را می توان تعیین کرد. با استفاده از همین روش، نرم افزاری تهیه شده است که تمامی این موارد را به صورت همزمان انجام داده و موارد مقتضی را با سرعت و دقت بسیار به صورت خروجی در اختیار قرار می دهد. 1B.Sc. Graudate, Department of Railway Engineering, Iran University of Science and Technology, Tehran, Iran. 2Assistant Professor, Department of Railway Engineering, Iran University of Science and Technology, Tehran, Iran. Wheel wear is a common problem in railway industry. Determination of the train wheel wear trend is very important in this industry, especially in subway system. That’s why; it is possible to have better maintenance planning by determining wheel wear trend. Comparison of obtained wear shows whether the wear condition will be acceptable or not, and will help to correct the direction characteristic and another parameters which are effective in wear. Life prediction is also important, so in different cases, such as wheel/rail, there are different criteria and methods for predicting the life of the components, being worn. In this paper, a method is proposed in order to determine and predict the wheel wear trend.. Determining this trend needs a complete databank of system wear condition. Therefore, in different logged distances, the wheel thickness of flange in the second line of Tehran subway was measured by gauge and by miniprof during thirty months. These information were imported to the prepared software, capable of fast and reliable processing of data. Our output data is flange wear rates in different periods and situations. By using these data, it will be possible to have better management on wheel maintenance and predict logged distance in which the wheels should be re-profiled and replaced. The period that the fleet will not be available for service can also be estimated. Meanwhile, the accuracy of results might be proved by comparing them with field measurements. Therefore, the wheel stock management parameters, wheel re-profiling and replacing timetable are obtained.